[map] Located just north of Bird Jackson Road, to the southeast of Jackson, between CR-2 (Gainestown Road) and CR-29 (Walker Springs Road). [Picture] Image showing RDS data from a Mazda car stereo showing the PS (station name), PTY (format) and and Radio Text fields. From August, 2017. Still shows old station slogan/name! This station was put on the air in 1964 by Jackson Broadcasting, as WTHG-FM, companion to the AM station of the same calls. The station debuted on 104.9 MHz with 3 kW from a 300 foot high antenna. The FM mostly simulcast the AM in the early days. The calls changed to WHOD-FM (Heart Of Dixie) in the mid-60's. The station and its AM sister were acquired by Rowdy McGee in 1966. The Vogel-Ellington Corporation got the station in the early 70's. The stations had a typical small town wide variety type format. By 1980, both the AM and FM were doing a MOR (middle of the road) format. By '82 or '83 the stations were doing country music full time. Around 1990 the stations had a mix of rock and country music. It's also around this time that the station made the jump to 94.5 MHz to get more coverage. They signed on the new channel with 9 kW. Eventually, the format morphed into a mix of adult contemporary and oldies, before settling on classic rock by the mid-90's. Around this time, ownership of the stations was in the hands of Bennie Hewitt, who later operated under the name Capital Assets. In the year 2000, the station debuted a bigger signal, operating with the now-current 30 kW facility. It was also in this year that the AM and FM dropped their longtime simulcast; while the AM went news/talk, the FM flipped to an adult contemporary music format. In March of 2002 the call sign changed to WHNB and the format was amped up to a hot adult contemporary format. In more recent years, the station has taken on a classic hits format, along with local high school sports programming of all kinds (split with WBMH). Bennie Hewitt's Capital Assets sold this station, along with WBMH and WRJX, for $500,000 to Jason Kyzer's Kyzer Communications, in March 2017. 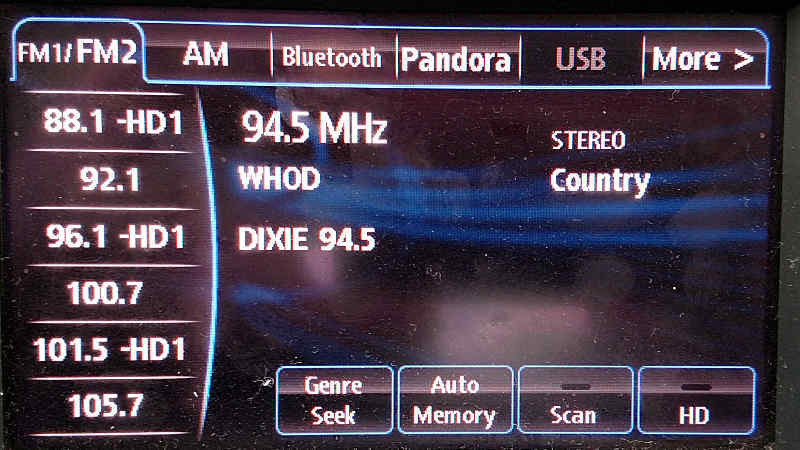 Later that summer in July 2017 the station's format was tweaked to a more variety hits format from classic hits, and the name was updated from the long time "Dixie 94.5" name to "Smash Hits 94.5". Kyzer took the all his area stations off the air in mid-November 2017, and filed for bankruptcy soon thereafter. In early February 2018 it was announced that Thomas A. Butts' Pine City Radio would be acquiring the former Kyzer stations for $200,000, from the bankruptcy trustee Terrie S. Owens. It is planned to return the stations to the air via LMA before the purchase is complete. This station appears to have resumed operations during the first or second week of February.